Both of these examples provide details such as: the item type (e.g. restaurant), name, image, rating value, author and organization. The above provides review rating details including: item type, name, author type, author name, rating value, best possible rating, publisher type and publisher name. Reviews must be ‘about’ another schema.org type. For instance, review markup should be nested within Book, Local Business, or Product objects. Single entities should be marked up as opposed to entire categories or collections of entities. This means that you should have markup on a single product page, but should not mark up every product on a category page. 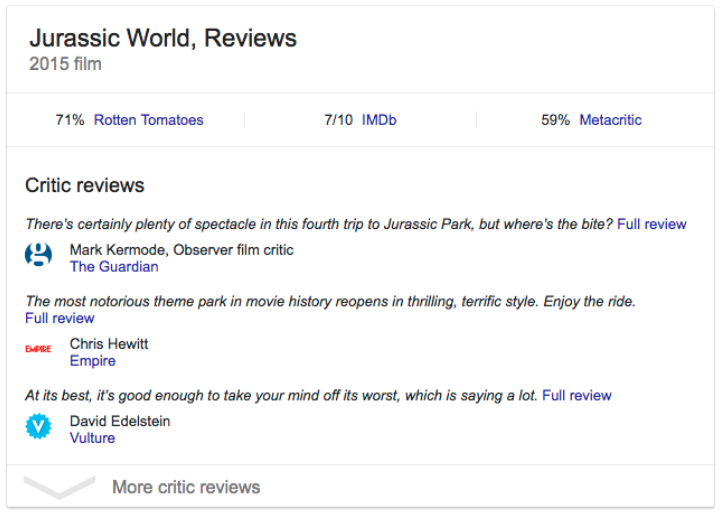 Ratings should be visible to users and not just found within the page’s markup. Hiding structured content does not comply with Google’s structured data guidelines. Using any form of manipulative behaviour can result in a Google penalty e.g. marking up content which is invisible to visitors or marking up irrelevant or misleading content. Google will mistrust this structured data information and you will receive a manual action message from Google’s search console indicating ‘Spammy Structured Markup’.